It takes a dedicated and resourceful parent to adopt a child with special medical needs. At Spence-Chapin, we guide families in how to make an informed decision about their family’s particular medical openness and offer support and resources before, during and after their adoption. These children thrive in loving homes with the right family who is dedicated to learning about, or already has experience with special medical needs! But how does a family determine if adopting a child with special medical needs from South Africa is right for them? 1. Learn about the most common medical needs in South Africa. Check out this article on the Top 10 Medical Needs in South Africa! 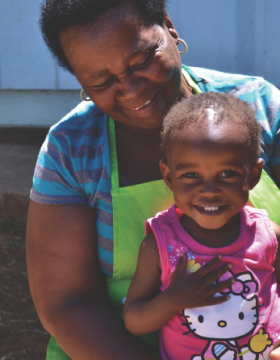 The most common needs as seen by Spence-Chapin, one of two American agencies accredited to provide adoption services in South Africa, include: HIV, extreme prematurity, developmental delays, auditory and visual impairments and unpredictable cognitive challenges. 2. Consider the medical and developmental care children receive in South Africa. JCW strives to provide an environment that caters to the overall development of the children in their care which includes their physical, emotional, spiritual, and educational needs. Children receive medical treatment at JCW through partnership with Thusanani Children’s Foundation. Thusanani provides safe and modern medical care to ensure each child receives the medical and developmental care they need – HIV testing and treatment, occupational therapy, physical therapy, antibiotics, surgery, well-baby visits, etc. Additionally, Spence-Chapin sponsors a “Granny Program” at JCW to help the children develop the important socio-emotional bonds that are so important to a child’s development. Through the Granny program, children are paired with surrogate “grannies” from their local community who spend special, one-on-one time with them every day. This humanitarian aid initiative gives institutionalized children the opportunity to form important healthy attachments with a trusted adult. We see incredible progress made by children who are matched with a granny. In South Africa the children call their grannies “gogo”! 3. Consult with an international pediatric specialist to make an informed decision. It’s recommended that families considering adopting a child with medical needs consult with a pediatrician about diagnosis, treatment and prognosis of specific conditions to consider if your family has the ability to provide the care a child will need. There are many experienced international adoption medical specialty clinics throughout the United States that are a resource for prospective adoptive families. Physicians with an international adoption specialty are familiar with common medical issues involved in intercounty adoption and many of the common needs seen in children eligible for international adoption. Because South Africa is signatory to The Hague Treaty on Intercountry Adoption, adoptive families benefit from a transparent and ethical process for receiving a child’s information. At the time of referral from South Africa, Spence-Chapin will provide all known social and medical history provided by JCW so a family can make an informed decision. The family will review the medical history with a Medical Specialist and support from Spence-Chapin. 4. Gather information about resources and eligibility for services in your state and community. Additionally, when considering the adoption of a child with special needs, it can be helpful to consult with other parents of children with medical needs or international adoptive families. They can be a great source of information, support and referrals. They may be able to share their suggestions, insights and recommendations for ways that you can strengthen your ability to parent a child with a medical need. It may also be helpful to prepare for what to expect through help from the local home study agency, special needs support groups or even online through adoption websites such as AdoptionLearningParnters.com. Do you have access to medical resources in your community that specialize in the treatment of pediatric special needs? Are you willing to advocate for your child in your home, school and community? Following the adoption of a child from South Africa, Spence-Chapin welcomes adoptive families to engage in post adoption services through our Modern Family Center. Spence-Chapin’s Modern Family Center offers counseling, parent coaching, post adoption support, mentorship and birthland trips. These services can be provided to families in person, over the phone or via video conferencing in all 50 states. We also invite you to attend our annual family events so you and your child can meet other South Africa adoptive families! Spence-Chapin finds families for the most vulnerable children in South Africa – children with a medical diagnosis who are in need of an international adoptive family! Through a partnership with Johannesburg Child Welfare (JCW), Spence-Chapin seeks families for toddlers and young children 18 months and older with special needs as well as sibling groups where at least one child has an identified need. Children with special medical needs are waiting for adoptive families in South Africa. Learn more about adopting a toddler from South Africa by clicking here or emailing info@spence-chapin.org.